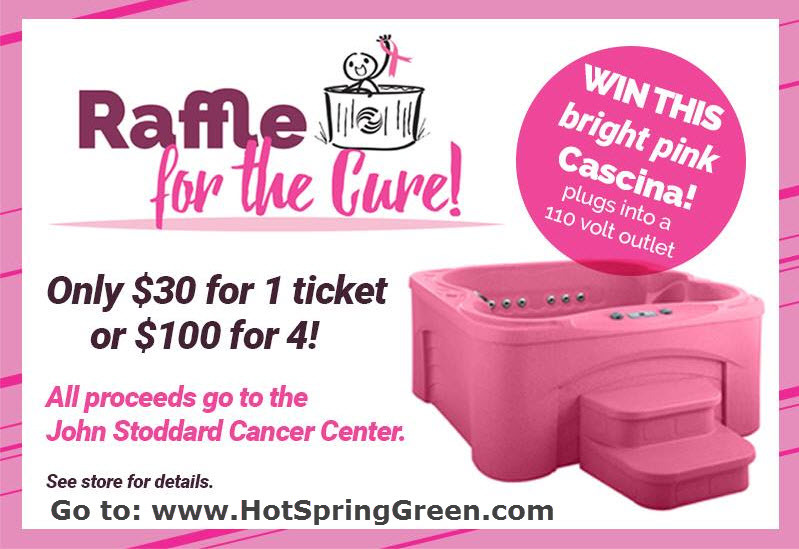 Hot Spring Spas, a portable hot tub and swim spa dealer serving the greater Des Moines area is raising money to help fight breast cancer during Breast Cancer Awareness Month. National Breast Cancer Awareness Month, is an annual international health campaign organized by major breast cancer charities every October to increase awareness of the disease and to raise funds for research into its cause, prevention, diagnosis, treatment and cure. The campaign also offers information and support to those affected by breast cancer. According to the National Cancer Institute, 1 in 8 women will be diagnosed with breast cancer in their lifetime but when detected early in the localized stage, the five-year relative survival rate is 100%. “This year Hot Spring Spas of Iowa is participating by raffling off one of their now famous pink spas, said Sean Schaben, co-owner. Consumers can purchase 1 raffle ticket for $30 or 4 tickets for $100. The pink Freeflow Spa has a retail value of $3495 and plugs into a standard 110 volt outlet. All 3 Iowa Hot Spring showrooms will be participating and proceeds will be donated to the John Stoddard Cancer Center. The raffle ends on October 31 for all locations with the winner announced shortly after. “These pink spas are bringing awareness to breast cancer in a way that’s unique and fun,” continued Schaben. And since soaking in a hot tub is a great way to relax and spend quality time with friends and family, many people use it as a way to reconnect with loved ones during stressful times. Consumers wanting to learn more about hot tubs and how they can help improve overall health and well-being are encouraged to pick up a copy of this free hot tub buyer’s guide “7 Critical Questions You Must Ask Before You Buy a Hot Tub.” Just call 515-270-8702 or visit https://www.HotSpringGreen.com for more information.